The need for the Imperium ceased over a year ago, with the release of Phoebe. N3 disintegrated while NC. and PL both lost the majority of their rental empires. Even if every major power in nullsec combined their forces, they likely wouldn’t have the strength to defeat the Imperium. So what is the point in its continued existence? Thanks to their leadership, structure and consolidation, the Imperium have been able to survive Phoebe and Aegis sov where others perished. Thus, although it is easy to see how the Imperium has survived, it’s not clear why. As no force can contest them, they no longer have a raison d’etre. Aside from the countless carebears and krabs in the Imperium, its preservation benefits one man in particular: The Mittani. Russian leaders of old used traditional and illegal RMT methods to make money, whereas The Mittani has come up with an ingenious way to do it completely legally. The past few weeks have highlighted this perfectly. The first example of cash-grabbing by the Imperium came in May. In a deal with John Smedley, CEO of Daybreak Games (formerly SoE) and friend of The Mittani, people who signed up for the game through themittani.com were given free exclusive items. H1Z1 was relentlessly promoted by Goonswarm leadership through TMC, Twitter and Jabber to the Imperium and wider Eve community for well over a month, likely in exchange for a fair amount of money. 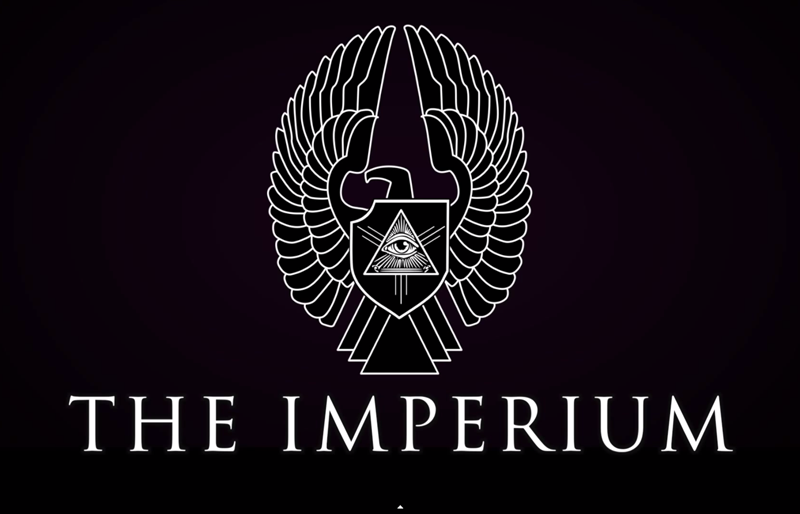 It was also decided that the CFC wasn’t a great name for monetisation, so the coalition rebranded itself as Imperium. Encouraging players to put down Eve and buy H1Z1 was justified by stating that the primary goal of the ‘invasion’ was to recruit players from the game then bring them over to Eve. As far as I know this had very little success. However, I’m willing to bet the campaign succeeded in making fat stacks for The Mittani. Then came the Fountain War book. Although I’m not opposed to the book in itself, and I do believe the book will be unbiased, the $150,000 funding goal raises some questions. According to the page none of the money will end up going to ‘The Mittani Media’, the official company behind the project, which prompts me to ask why it is being so fanatically promoted. There’s been numerous Imperium broadcasts about it daily, articles written to promote it and during a time clicking any part of the background on TMC would take you to the kickstarter page. There are reasons The Mittani is promoting the book, and although attracting fresh meat may be in his interest, it is definitely not his primary focus. 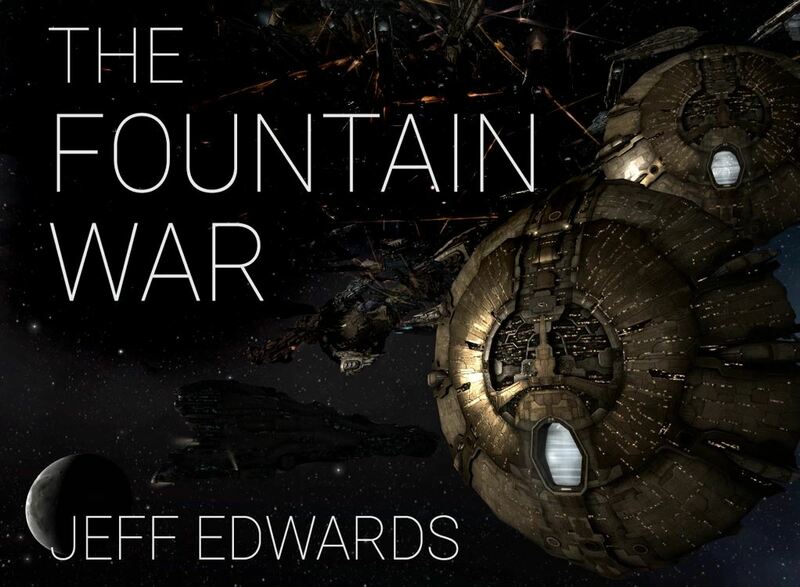 The Eve history book promises to bring in a lot more players than Jeff Edward’s publication, and I don’t remember the background of themittani.com becoming one great hyperlink to the kickstarter page for that. Nor can I recall them posting an article when some generic podcaster announced their support towards it. If The Mittani was doing this to bring in new players, he would have suggested CCP take it up rather than do it privately. When the Imperium declared an invasion of Cloud Ring we were confronted with the most damning evidence yet that the coalition is redundant. I used to quite enjoy The Mittani’s war speeches, when the foe was real, there was an actual threat and there would be an actual war. However, this one was just delusional, filled with mirages of enemies in a desperate attempt to create content, all while giving publicity to the kickstarter. It started off by claiming people sceptical of the Fountain War book were actively trying to kill the game by starving it of new players the book would bring in. You’ll notice the irony here. 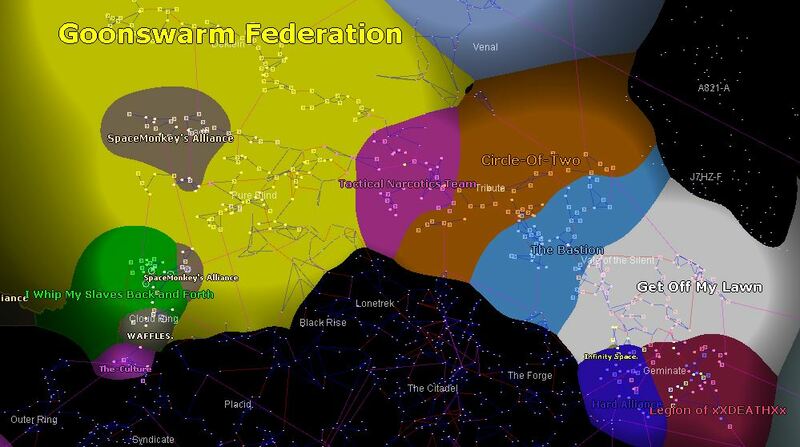 After claiming that people were trying to kill the Imperium by driving new players away because they refused to kickstart a book, The Mittani declares war primarily on a 2.2k man alliance that is mostly composed of new players. It was justified because ‘we also have a new player friendly corp’, with this rather hilarious post from a director in Karmafleet. Although Pandemic Horde are branded as cowards for retreating when outnumbered 15-1, I’m willing to wager newbies there have had a more meaningful experience than those in Karmafleet. He also points out a fair few times that this represents an existential threat to the Imperium’s existence. A nullsec coalition of 3k members, primarily composed of newbies, along with a loose band of lowsec alliances, cannot pose a threat to a coalition of 40,000 members with hundreds of titans and thousands of capitals no matter how hard you spin it. He observes that ‘we have seen this pattern before’, where a large force masses up on the border then declares war on the Imperium, á la HBC and various times before that. These occurred before Phoebe and Aegis sov; it’s no longer possible for alliances with sov to abandon the home front in the knowledge it will be safe. Even PL and NC. combined can’t seriously challenge them. So the Imperium will easily take Cloud Ring and maybe do some damage to infrastructure in lowsec, but what then? The sad truth is that no one can contest the Imperium. Although disappointing for people in nullsec, it’s worse for the members of the Imperium. What’s the point in logging in when the 1,000 people in your coalition’s fleets will be able to capture X structure with no resistance regardless of whether you’re there or not? What’s the point in moving your ships to the staging system when your superior, organised force of 40,000 is going to war against an inferior, scattered group of 5,000? What’s the point in being a member of a coalition which can never lose a war? If you’re a humble line member of FCON who loves ratting all day I guess you’d be fine with that; the stability the Imperium offers is a good thing. It’s a mutually beneficial relationship – The Mittani gives you space, you allow him to continue making money. But consider this: There are pilots just like you in nullsec, who actually contribute to something and make an impact on the map when they log in. They likely fight for a leader who commits his time to the game to make content for you and your comrades, rather than one who does so to make real money. Any Imperium alliance could survive outside the coalition and enjoy a more fun and meaningful existence. We’ve even seen an individual corporation (Black Omega Security), kicked from Goonswarm for lack of contribution, go on to become a relevant player in Syndicate. The evolution of Goonswarm and the Imperium over the past decade is truly fascinating. 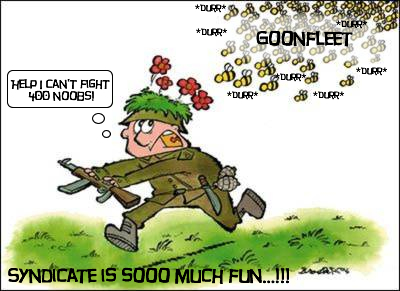 Goonfleet originally established itself as being a carefree group of players fighting ‘elite PVP’ types and those who took the game too seriously. Truthfully, what is the difference between alliances in the Imperium in the present day and the very people they swore to destroy? Tubrug1 started playing Eve in 2010, but didn’t actually do anything of note until 2013 when he founded the Eve Onion. @Tubrug1 on Twitter.